Each Saturday on Lefty's Last Cry, we have the tradition of a political Caption Contest. They have gone well in the past, with a variety of funny interpretations. If you have an idea for a funny caption respond in the comments section for the photo above. At the end of the weekend we'll pick the best one and post it on our Comedy page! While you're at it, check out our old Caption Contest winners here. The winner of this week's caption contest is Bill. Check it out here. 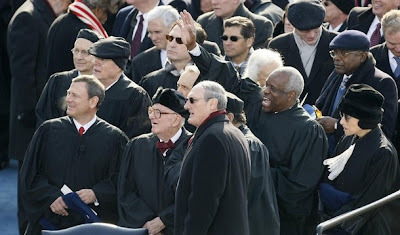 In a pathetic move to pander to the racially motivated base of the Virginia Ku Klux Klan Republican Party, Governor Bob McDonnell, class of '76, yesterday declared April to be "Confederate History Month." What a douche. Of course, nowhere in the Governor's proclamation does he actually name any specifics of "this defining chapter in Virginia's history." Nor does he provide any historical reference to, or commentary on, "the context of the time in which it took place." ...You know, like slavery. But to understand this "in the context of the time in which we live," is quite simple. We live in the age of the first African American president of the United States of America. A tremendous symbol of progress from the dark underbelly of our nation's history; yet one which causes a certain segment of the population (namely, the base of the right wing of the Republican Party and the Tea Party movement) a deep sense of discomfort because of their racist and bigoted inclinations. Rather than help lead the nation along the path of progress and reject the extremist tendencies of their party, Republican Party leaders have been stoking the fears of their mentally unstable base. Congratulations, Bubba. You've made the University of Notre Dame proud. 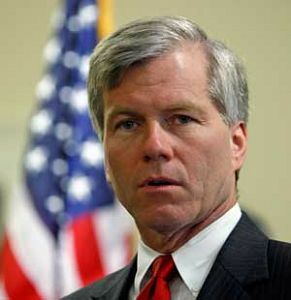 * In addition to glossing over the small role that slavery played in the Civil War, Bob McDonnell demonstrated his progressive and far reaching intellect in his master's thesis where he decries feminists and working women as "detrimental to the family," harps on the evil that is contraception, and dabbles in gay bashing. This wasn't merely the blabbering of a young conservative trying to find himself in college... he wrote this as an already married man while 34 years old. Stay classy, Bob. Virginia Gov. Robert F. McDonnell (R) apologized late Wednesday for failing to include slavery in his proclamation declaring April as Confederate History Month. In his statement, McDonnell said slavery "has left a stain on the soul of this state and nation." This past month will go down in history as the month when we finally passed Health Care Reform, something that couldn't have happened without young activists (that's you, readers) writing letters, making phone calls, and getting the message out there that America needs reform. The landmark reform will also go down as one of the most contentious pieces of legislation ever passed, and instrumental to its passage was making sure that Americans are able to discern the truth about the bill from the plethora of falsehoods being put out by the angry and confused or the downright maliciously manipulative. 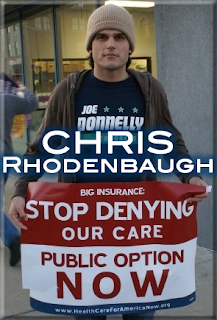 Chris Rhodenbaugh stepped into the fray this month to fight for health care, appearing with Lefty's Last Cry editor Brendan on local channel Fox 28, and being interviewed in the Observer, making the case for health care reform and explaining that the bill that passed does not fund abortion. He also wrote two quality posts to supplement his media appearances. 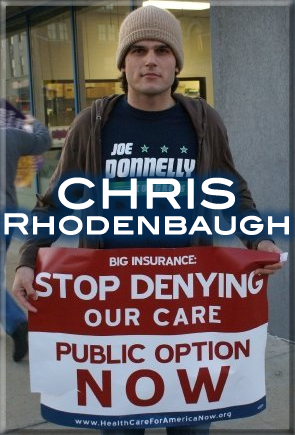 (See "College Democrats in the Media Discussing Health Care" and "Healthcare Reform DOES NOT Fund Abortion"
Chris also wrapped up his final term as Co-President of the Notre Dame College Democrats in March, and made multiple appearances on our live podcast, Lefty's Last Laugh (Airing Thursdays at 9PM Eastern, with old episodes on our YouTube Channel). Chris has been writing for us for over a year now, so be sure to check out his past work on Lefty's Last Cry. We hope to see more from him in the future. The job of an American soldier is horrible and forces individuals into precarious situations where right and wrong are as clear as the dust cloud from an artillery blast. Our military operates within a strict formal protocol that intends to minimize random violence and civilian death while keeping our soldiers safe. Most of the time, our soldiers are very professional and obey orders appropriately. Occasionally, individuals deviate from protocol or take liberties in combat that produce disastrous results. Some incidences are reported and investigated. Others go unnoticed. The following is a video from 2007 of American soldiers engaging a group of Iraqis they (presumably) believed to be insurgents. What is most disturbing in this video is not an egregious dismissal of protocol, but the communication between soldiers who seem to be operating within standard protocol. If I did not know differently, I could have easily mistaken the footage as cinematics or gameplay from Call of Duty: Modern Warfare 2. As an outsider, I do not intend to cast a generalization upon all American soldiers. I know and respect many individuals who have served in combat situations. Let the following example serve less as anti-military propaganda and more as a sad, telling example of how disgusting and unfortunate war can be. There are no winners in war, as death is the mother of retaliation. When man kills his enemy, he becomes his own. And as he stands alone atop his fallen foe, he is without life. For war yields no victor, but only great loss and greater loss. WARNING: Contains graphic footage of combat violence and death. PS: I'm glad that the record companies don't control military footage. The time of year has come for the annual Club Coordination Council to crown the Notre Dame Club of the Year. 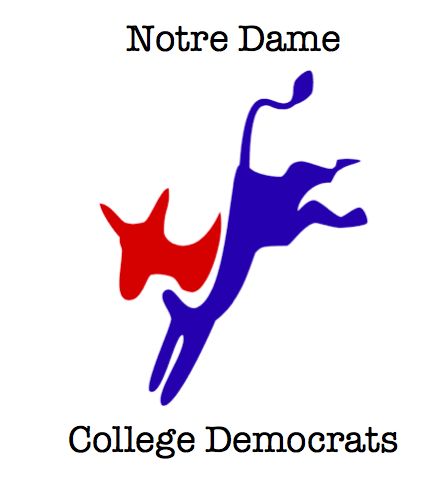 Our very own Notre Dame College Democrats have done great work and have proven to be one of the most vibrant, active clubs on campus. If you are a Notre Dame student, we would love for you to help us win the award. 1) Get the nomination form here. 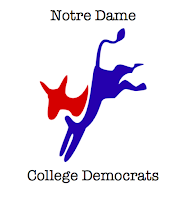 2) Type "College Democrats" under club and "Special Interest" under division. 3) Add your reasons for nomination in the spaces allowed. To save you time, we've listed some potential reasons below. Feel free to add your own and/or re-word the options below. Maintained a solid membership with 40 attendees at every weekly meeting. 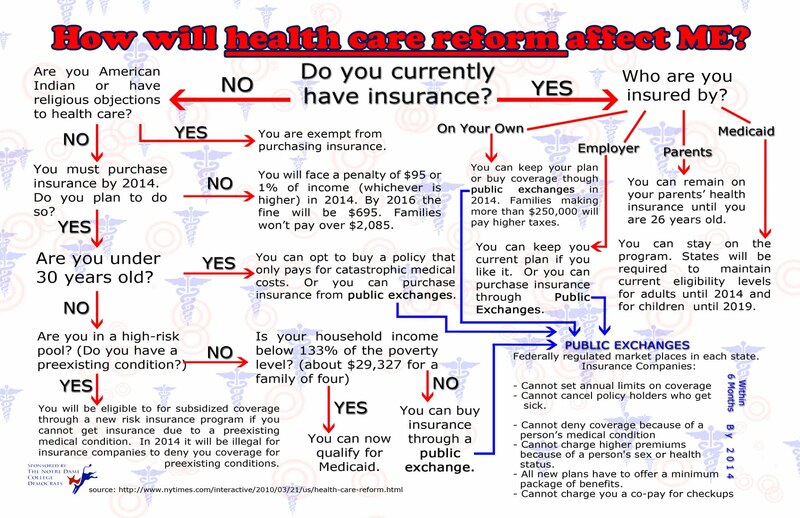 Operated over 20 phone banks, making over 6000 calls for health care reform. Had a consistent media presence in The Observer. Worked regularly with other Indiana College Democrats chapters and attended statewide events such as a fundraiser dinner and CDIN state convention. Worked broadly on issues outside of campaigning such as clean energy, GLBT rights, genocide, and labor. 4) Finally, send the document to ccc@nd.edu as soon as possible. 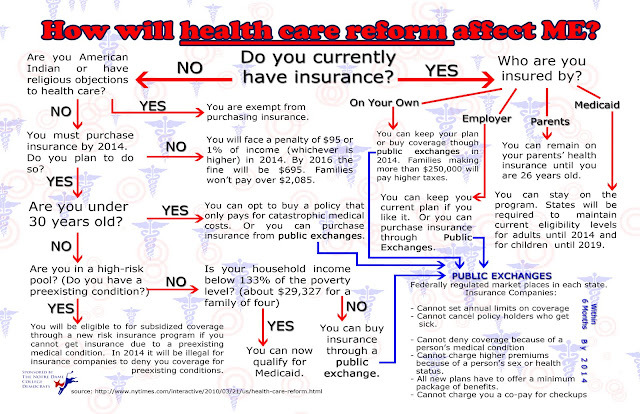 PS: Here's a great little infographic about health care reform that we'll be posting around campus.